Officials used Narcan on the driver accused of hitting and killing a 2-year-old boy when the driver started to fall asleep while he was being interviewed by police, according to Assistant Prosecutor David Wood. 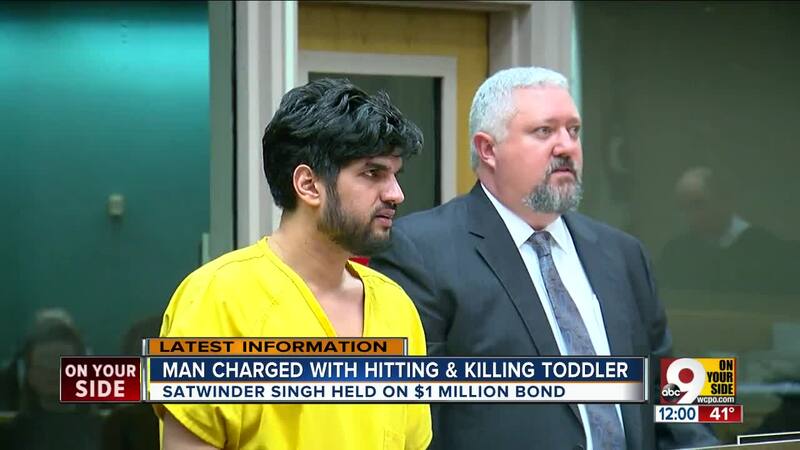 Satwinder Singh is being held on $1 million bond. CINCINNATI -- Officials used Narcan on the driver accused of hitting and killing a 2-year-old boy when the driver started to fall asleep while he was being interviewed by police, according to Assistant Prosecutor David Wood. The Narcan had a positive effect, Wood said, indicating 31-year-old Satwinder Singh was “under the influence of serious drugs." Singh's license was also suspended at the time, according to court records. Singh lost control of his Dodge Ram pickup on the Hopple Street Viaduct Sunday afternoon, jumped the curb and struck Dameon Turner and his father, 33-year-old Dameon Turner Sr., who walking ahead of the stroller. Turner Sr. was not injured, police said. Dameon died at Cincinnati Children’s Hospital on Monday. His mother, Brittany Hutcherson, said Dameon was full of life and loved by everybody. Judge Brad Greenberg on Wednesday issued a $1 million bond for Singh. Greenberg called the crash a homicide. "I don't consider this to be an accident at all when you get high on illegal drugs and then you get behind the wheel and kill someone,” Greenberg said. “That's not an accident, that's a homicide." Singh was arrested in Campbell County, Kentucky on Dec. 22 and charged with operating a motor vehicle under the influence, possession of cocaine, possession of drug paraphernalia and other charges related to registration plates and insurance. His license was suspended after that incident. In this crash, Singh was charged with aggravated vehicular assault and leaving the scene. The case will go before a grand jury on Jan. 9.